I will travel pretty much anywhere for a good pampering. 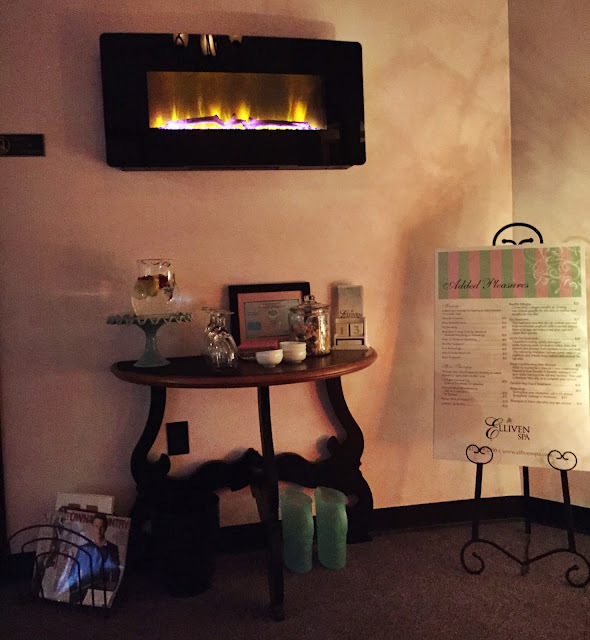 So when I had the opportunity to visit Elliven Spa recently, which is located just south of Pittsburgh in Bridgeville, I (of course) giddily leapt. I was invited into Elliven for a massage, facial, manicure and pedicure. Sounds divine, right? Well, IT WAS. There's really nothing better than walking into a spa at 10am and walking out at 3pm, after being pampered from head to toe so much that you're in a blissful haze. (The haze was altered slightly by the horrible driving conditions, but I tried to hang onto as much of it as possible.) Immediately upon entering the spa, I was put at ease by the receptionist at the front desk, who ushered me back to the changing area and lounge and offered me champagne (I declined, since it was 10am, and settled upon fruit flavored water instead). The changing area is pretty massive and feels private even though it's used for everyone visiting the spa that day (individually, of course). After donning my robe and slippers, I stored my belongings in a cubby and walked out into the relaxation lounge. As you can see from the photo above, it's quite serene, thanks to the fire on the wall, the dim lighting and the foot bath (not pictured) I was treated to while I waited for my services to begin. A facial that's customized and personalized just for your skin. It includes all of the facial standards -- cleansing, steam therapy, exfoliating, extractions and a mask -- in addition to an upper body and scalp massage. To say that my skin looked and felt AMAZING after this treatment would be an understatement. My skin was unbelievably dehydrated I was also experiencing more breakouts than normal on both my forehead and chin prior to this facial. Well, after an hour on the table, it was restored to its former glory -- blemish free, nourished, moisturized and GLOWING. My esthetician was also THE nicest person ever, and we had such a fabulous conversation about all things beauty and Pittsburgh (including our shared love of multiple Pittsburgh restaurants). $85 and up for 60 minutes. $110 and up for 90 minutes. I could honestly get a massage every day for the rest of my life and still not feel like it was enough. My migraines cause so much tension in my back and shoulders that I'm pretty much always in tightly wound knots. But my therapist really was able to work most of the kinks out through deep, even strokes while still making me feel so relaxed that I fell asleep on the table. My pain and tension quite literally melted away as I drifted off into a peaceful slumber. $55 for 30 minutes. $85 for 60 minutes. $110 for 90 minutes. Want the best mani and pedi in Pittsburgh? Elliven is IT. My nail technician, Kelli, paid such extreme attention to detail throughout every moment of my services. Shaping, buffing, cuticle trimming, massaging, polishing ... this was honestly one of the best manicure and pedicure experiences I've had to date. My nails were seriously SO SMOOTH at the end of it all that once my polish was dry, I couldn't help but running my fingers over them over and over! The polishing was also exquisitely done. Elliven has a fantastic nail polish selection (Zoya, OPI and Essie, in addition to gel) and I was a little overwhelmed with all the options before me! I went with OPI Pompeii Purple (which is more fuchsia than purple and contains some super gorgeous shimmer) on my toes and OPI My Dogsled Is A Hybrid (a rich hybrid, if you will, of teal, aqua, mint and seafoam) on my tips. I actually already reviewed my manicure here, and I loved the color on my toes so much that I immediately ran out to purchase it at Ulta. The best part? My manicure lasted for over a week without chipping and my pedicure lasted for a MONTH. Talk about staying power. $20 for a manicure. $50 for a pedicure. For more information about Elliven Spa, visit ellivenspa.com. I LOVE the blissful haze after leaving the spa - and it's been too long since I experienced it. That must be remedied ASAP! I need to schedule a spa day soon. I need some pampering. Love your mani! That sounds like the perfect day, and your mani is beautiful! I need to find some me-time for a spa day sometime this century. Sounds like an incredible experience and that polish is s pretty! What an awesome post! I definitely need a spa day soon! 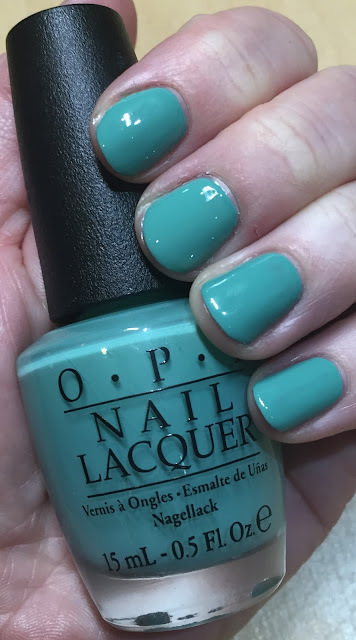 My Dogsled is a Hybrid is one of my fave OPI shades ever! We need to spa together!